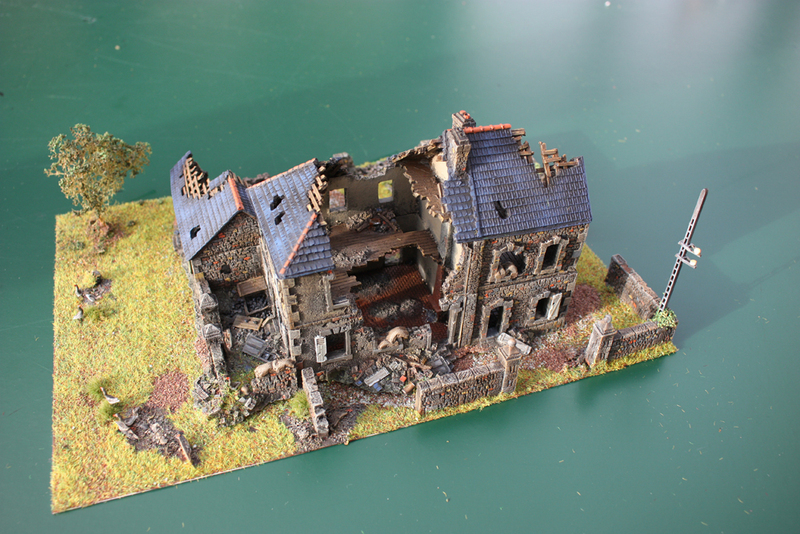 farmstead,add a few extras and paint it all up. work which was a lot better than mine. floors for figures inside the buildings. 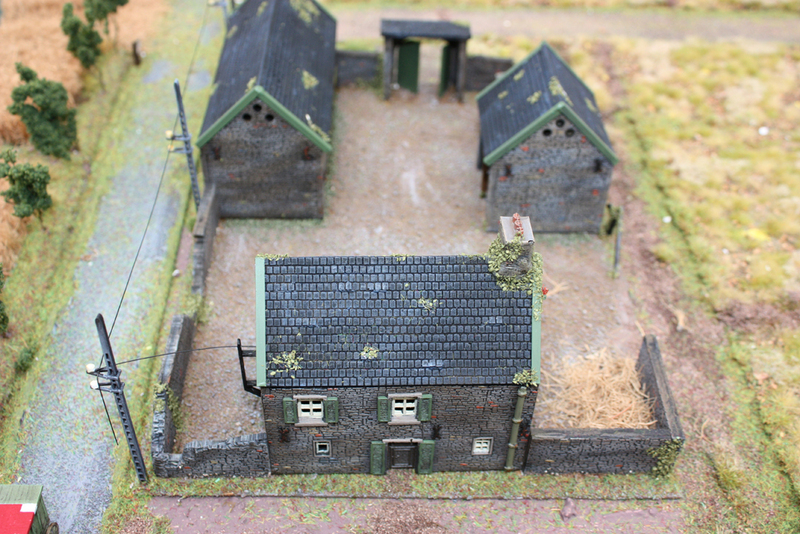 any gaps in the buildings with green stuff. 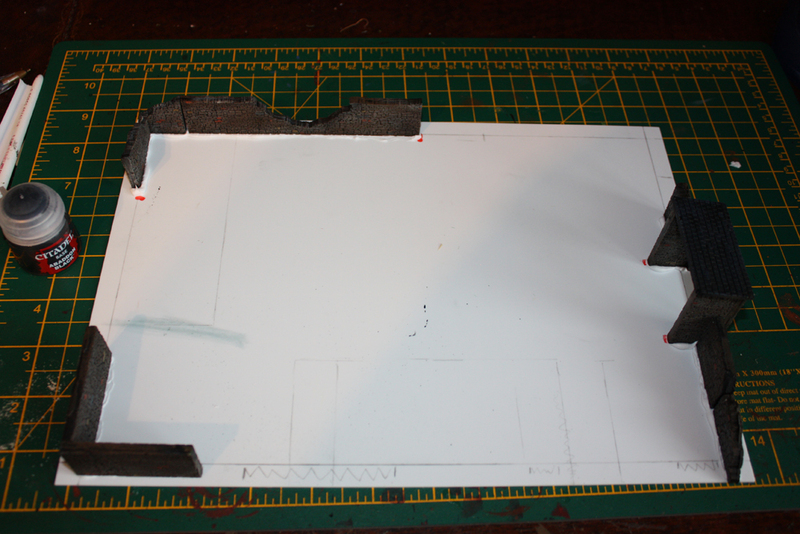 parts) and cut them to size to fit the base. is the only one you can do. 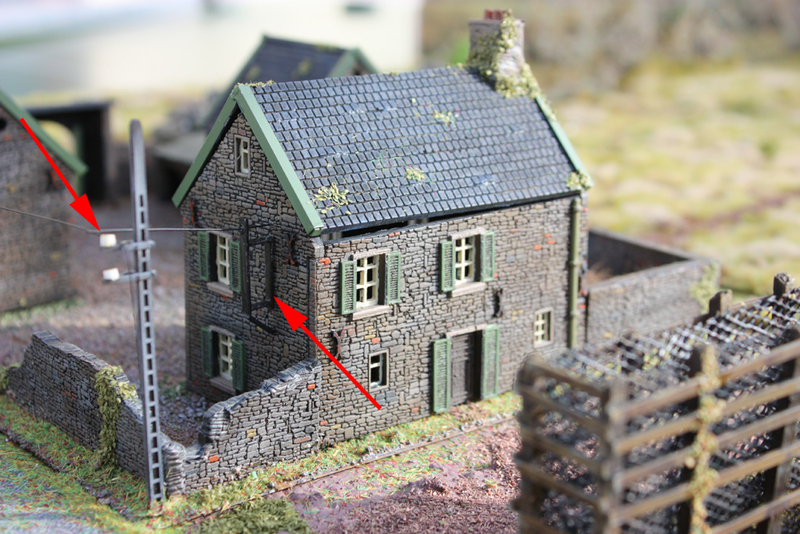 giving different colours across the brick work. 1. 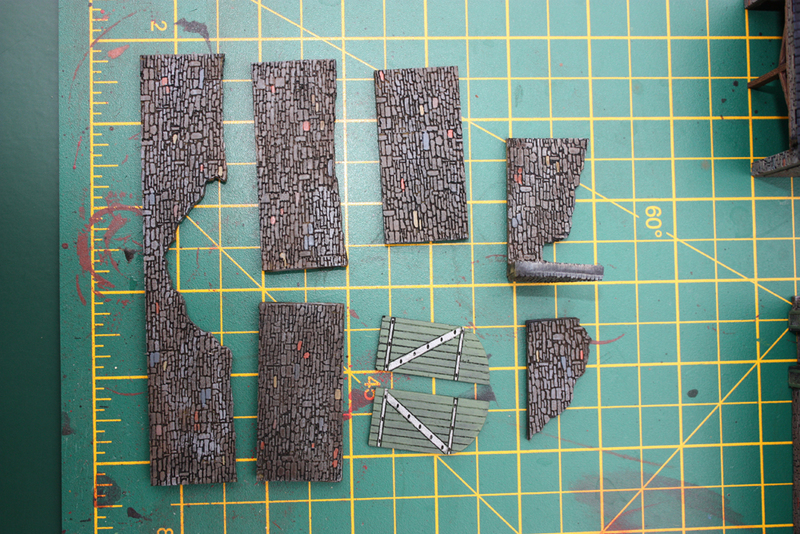 I base coated all the buildings and walls GW Chaos black. 2. I dry brushed everything Vallejo Flat Earth. 3. I dry brushed everything GW Dawnstone. 4. I dry brushed everything Vallejo Stone Grey 884. 5. I dry brushed everything P3 Troll blood in wavy lines. 6. I dry brushed everything GW Steel Legion in wavy lines. up I used Vallejo Red Leather. 8. 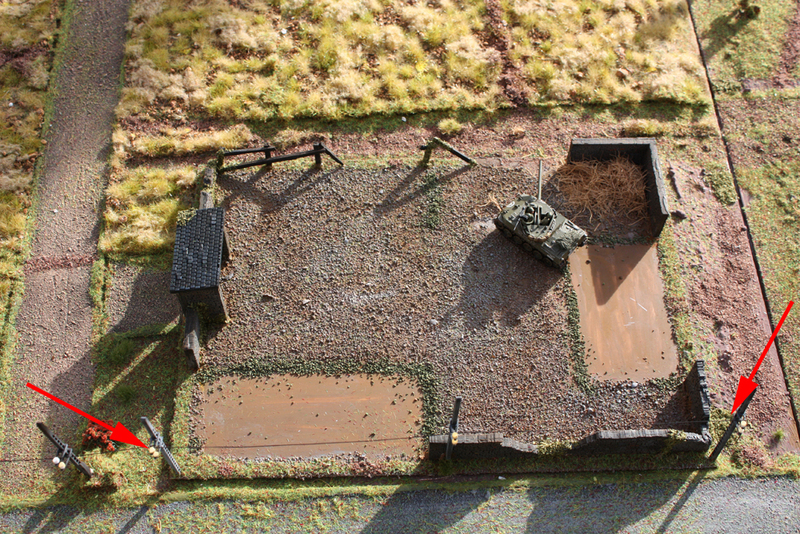 GW Tallarn Sand brick picking. 9. GW Mechanicus Standard Grey brick picking. 10. GW Gothor Brown brick picking. 11. 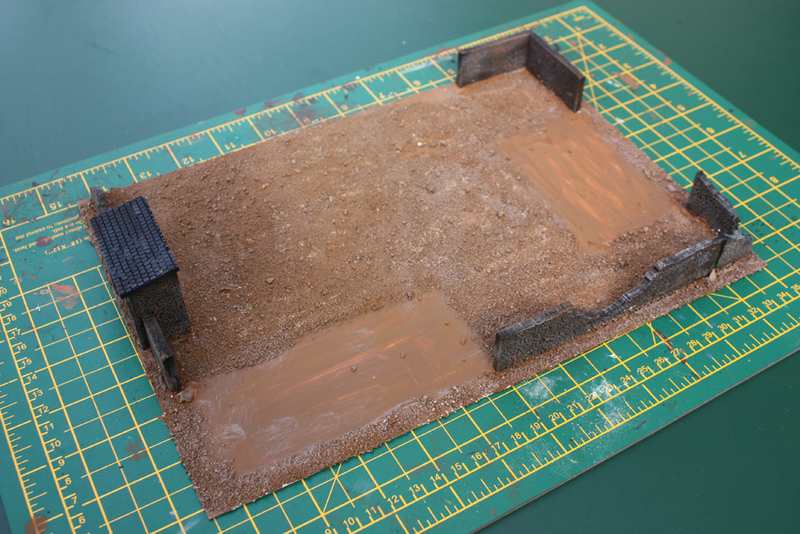 GW Agrax Earthshade wash over all the brickwork. Doors: Wooden doors and shutters were painted GW Loren Forest. 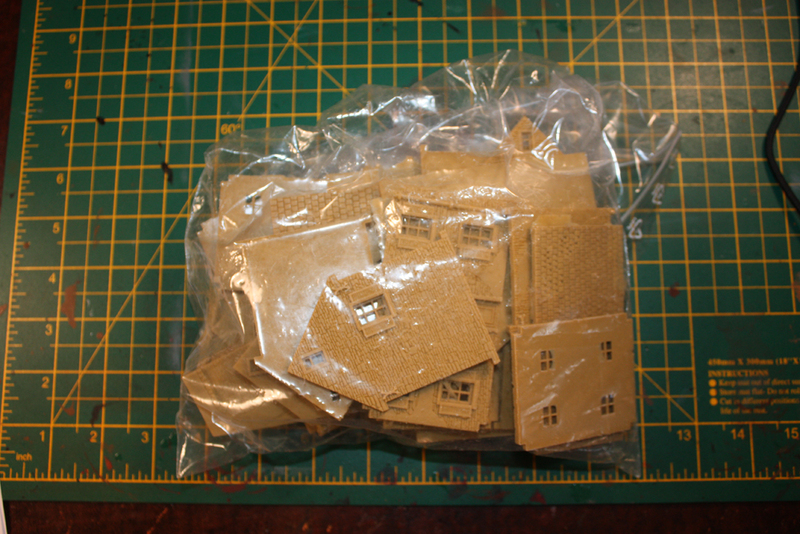 Window Frames : GW Bleached Bone. 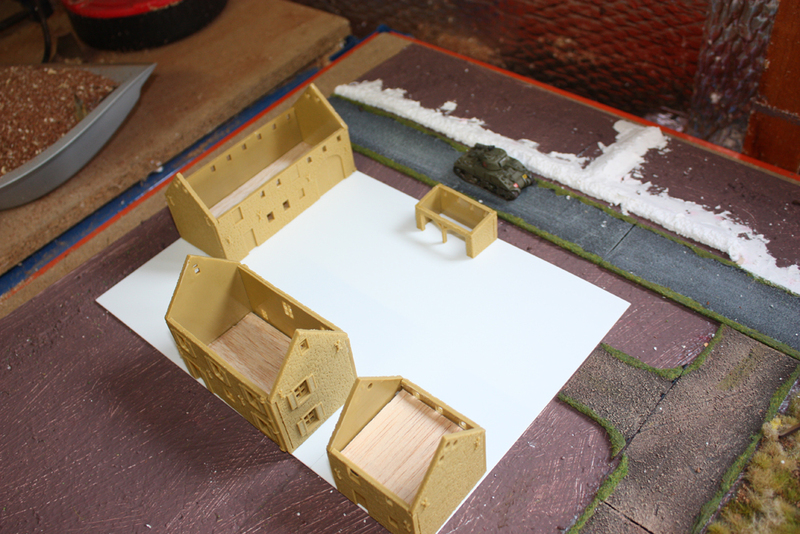 Window and Doors Sills : GW Baneblade Brown. Drain Pipes : P3 Traitor Green. Other Doors : Vallejo Flat Brown. 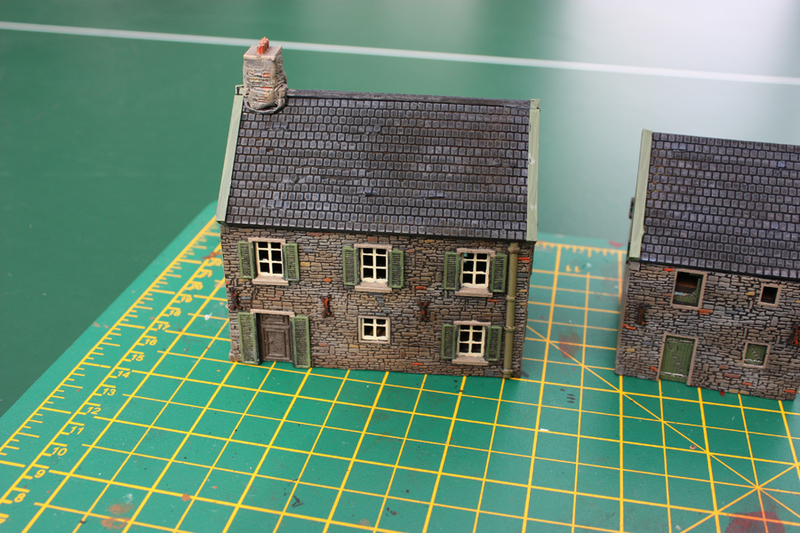 Doors, shutters & sills GW Agrax wash. 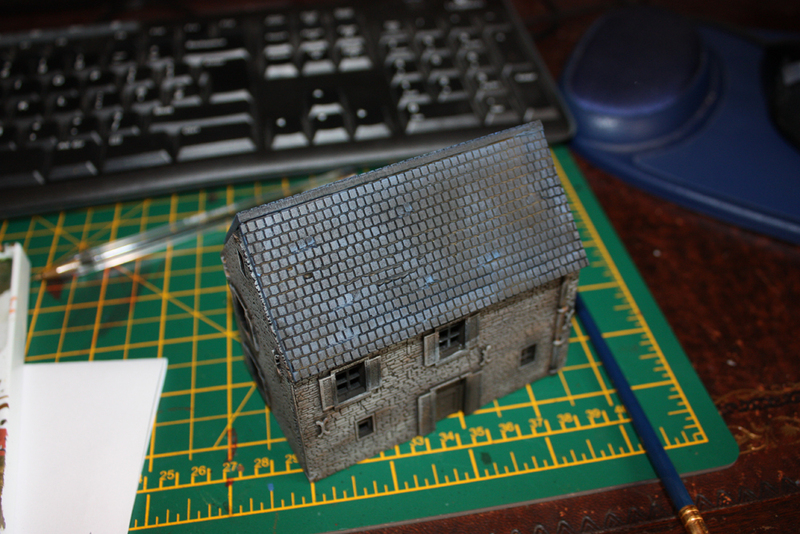 Roof: GW Aldorf Blue dry brush. 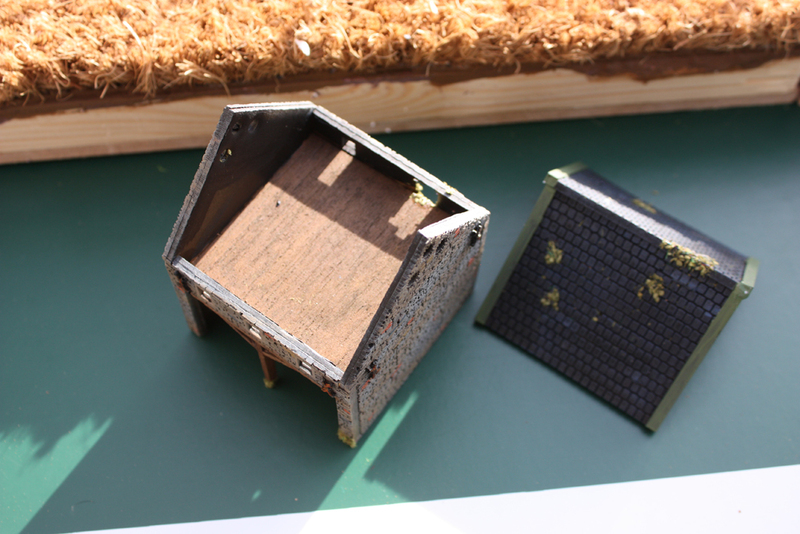 Roof: GW Agrax Earth shade wash.
then Baneblade brown and finally Dawnstone. walls and then painted as described earlier. 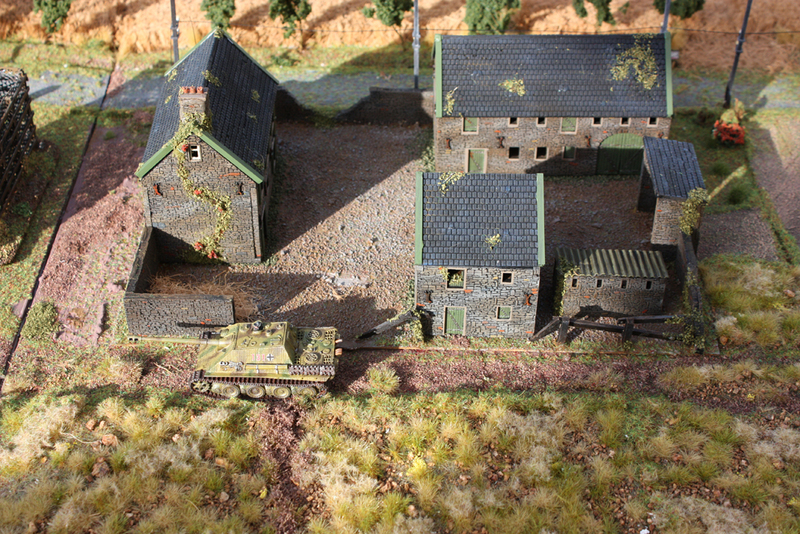 the foliage is from Treemendus and is stuck on with PVA glue. looks just like lead when painted up. plasticard base up and you don’t rip the poles out. can be easily lifted up. basically has enough spring and tension to hold itself up. Where the wire is attached I used good old super glue.